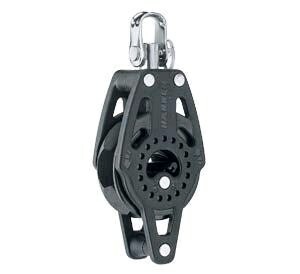 Carbo rachets allow sailors to hand-hold loaded lines and offer balance between holding power and controlled easing. Nylon resin sideplates are densely packed with long glass fibers for a compact block with a high strength to weight ratio. Machined aluminum sheaves are Hardkote anodized for strength and corrosion reistance. Eight facets hold line securely. Ball bearings, sheave and sideplates are UV stabilized with carbon black for maximum protection. The 40mm rachets are ideal for jib sheets and spinnakers where size and weight are critical. The 2608, 2609 and 2614 have on/off switches; other 40mm ratchets are always in ratchet mode.